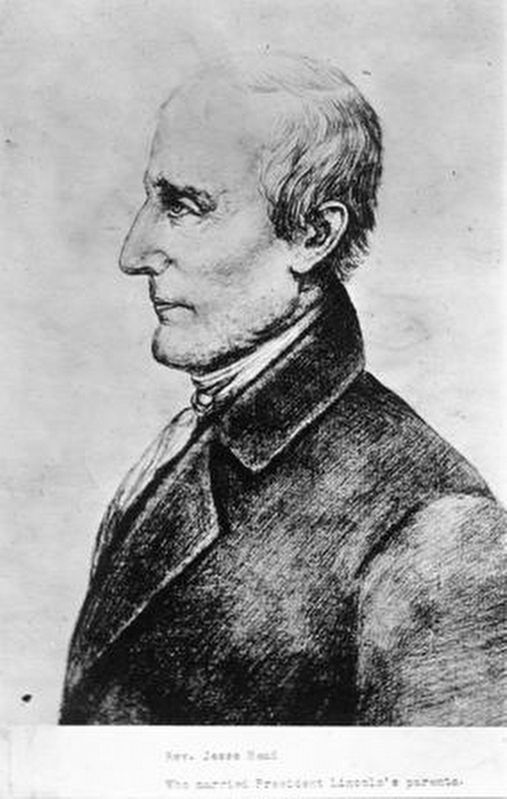 On June 12, 1806, he performed the marriage of Thomas Lincoln and Nancy Hanks, who, in 1809, became the parents of Abraham Lincoln, 16th President of the U.S. Head, born in Maryland in 1768, "came a-preaching" to Kentucky in 1798. Cabinet maker, justice of peace, on Sundays he preached fearlessly. 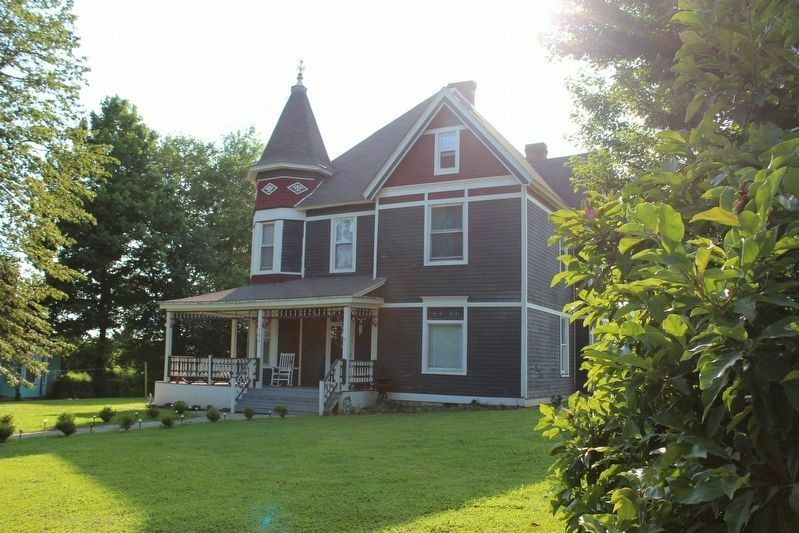 Moved shop to Harrodsburg, 1810, kept on preaching, began newspaper. Location. 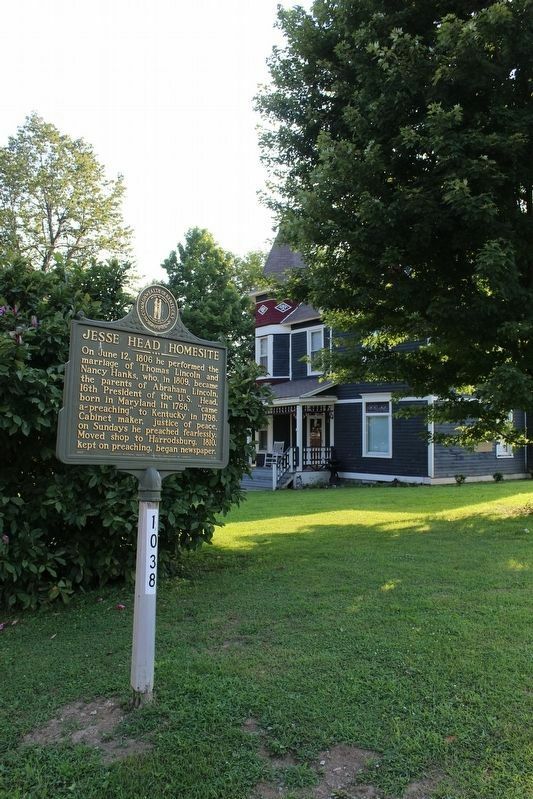 37° 41.167′ N, 85° 13.267′ W. Marker is in Springfield, Kentucky, in Washington County. Marker is at the intersection of Lincoln Park Road and East High Street, on the left when traveling north on Lincoln Park Road. Touch for map. Marker is in this post office area: Springfield KY 40069, United States of America. Touch for directions. (about 300 feet away); World War I Monument (about 300 feet away); Lincoln Homestead (about 400 feet away); War Memorial (about 400 feet away); Lincoln - Hanks (about 400 feet away); House of History (about 400 feet away). Touch for a list and map of all markers in Springfield. More. 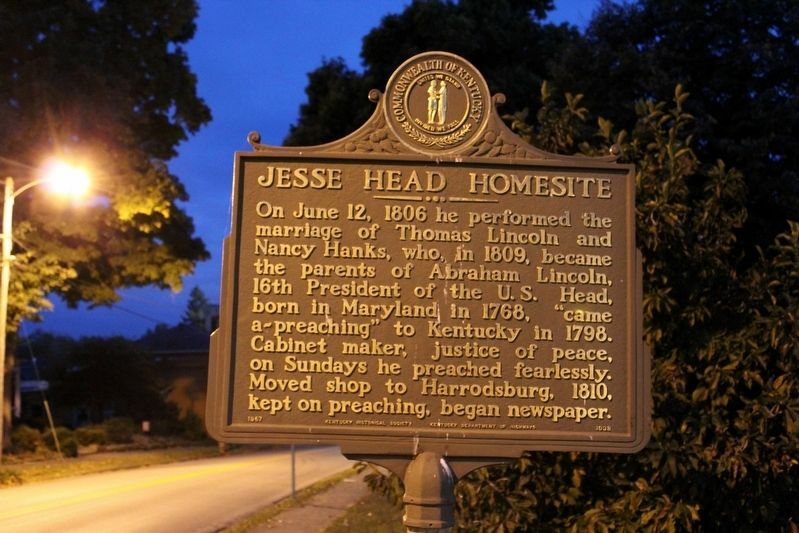 Search the internet for Jesse Head Homesite. Credits. This page was last revised on August 12, 2018. This page originally submitted on November 8, 2016, by Tom Bosse of Jefferson City, Tennessee. This page has been viewed 109 times since then and 4 times this year. Photos: 1. submitted on November 8, 2016, by Tom Bosse of Jefferson City, Tennessee. 2, 3. submitted on August 12, 2018, by Tom Bosse of Jefferson City, Tennessee. 4. submitted on November 8, 2016, by Tom Bosse of Jefferson City, Tennessee. • Bill Pfingsten was the editor who published this page.